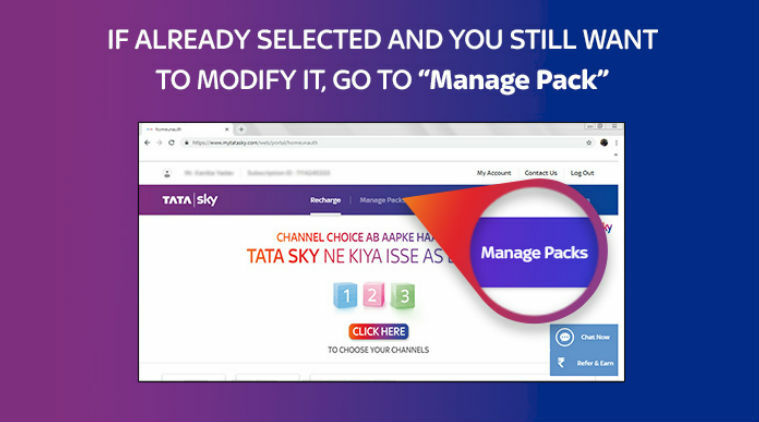 Apart from curated packs and plans from Tata Sky, users can scroll through the channel list and make their own pack. After the new DTH regulations of TRAI (Telecom Regulatory Authority of India) came into effect, all the existing plans of the DTH service providers like Tata Sky became invalid. Under the new framework, Tata Sky has created new channels packs and plans, which make the channel selection process for easier for the subscribers. The other category is “Pan-India Curated Packs”, which has 14 available plans starting from Rs 179 per month for the Hindi Bachat plan with 31 channels. The costliest pack under this category is Premium Sports English HD plan that costs Rs 745 per month and offers 134 channels. Users can click on a pack to see the included channels under that pack. Other categories under the curated packs section include the Maharashtra Curated Packs, West Bengal Curated Packs, South Basic Packs, South Family Kids Sports Packs, South Premium Packs, South Dual Language Basic Packs, South Dual Languages Premium Packs, Smart Packs, Tamil Nadu Curated Packs, Andhra Pradesh & Telangana Curated Packs, Karnataka Curated Packs, and Kerala Curated Packs. All of these categories carry curated packs that differ in pricing and channel lists. Tata Sky regional packs offer a total of 33 regional language channel packs. These plans also include FTA channel lists with zero cost and other plans range from Rs 7 per month (Gujarati Regional pack) to Rs 164 per month (Tamil Regional HD pack). As the name suggests, Add On/Mini Packs are genre-based mini packs that can be added to the base pack. The category includes 27 packs dedicated to cricket channels, music channels, lifestyle channels, movies channels, kids channels and more. The packs range from Rs 0 (zero) per month (FTA English News) and Rs 5 per month (Hindi News) to Rs 202 per month (Annual Cricket English). Tata Sky is also providing channel packs curated from a single broadcaster like Sony, Zee, Disney, NDTV, Discovery etc. There are a total of 16 broadcaster packs and the cheapest pack costs Rs 0.59 per month (TV Today’s Hindi News pack). Apart from these packs, Tata Sky subscribers can go the Channels tab and manually select channels one by one from the given categories. The channels are listed along with their monthly price under categories like Hindi Entertainment, English Entertainment, Hindi Movies, English Movies, Music, Hindi News, English News, Kids, along with regional categories like Tamil, Telugu, Gujarati, Marathi, Bengali etc.